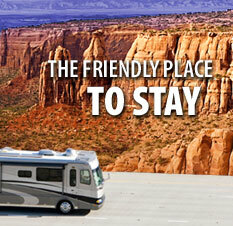 We've put together some links to help you enjoy our beautiful Grand Junction area. In addition to our wineries and the Colorado National Monument you will meet friendly people and experience our fabulous year round climate. 45 minutes to the largest flat top mountain in the world. Home of over 250 lakes for fishing and in winter, snowmobiling and both downhill and cross country skiing are available at Powderhorn Ski Resort. 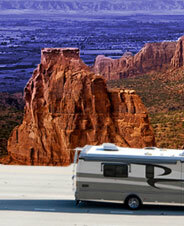 20,000 acres of red rock canyons, arches, spires and many hiking trails. Enjoy one of Colorado's largest and most diverse outdoor sculptured art displays. Located in downtown Grand Junction. 9 miles west of the RV Park in Fruita. The Grand Valley was home to the largest dinosaurs in North America. See animated and robotic dinosaurs and many exhibits. 1 mile east of the RV Park is the Western's Slope's largest regional shopping mall. Over 120 shops, restaurants and department stores. Pedestrian and cyclists enjoy the sites and sounds of a variety of wildlife on trails that meander along the Colorado River. 14 wineries within 10 miles of the RV Park in the area provide a nice choice and selection of wines. 2 miles. 4 public courses! Website Design and Development by: Paragon — Websites that Work!